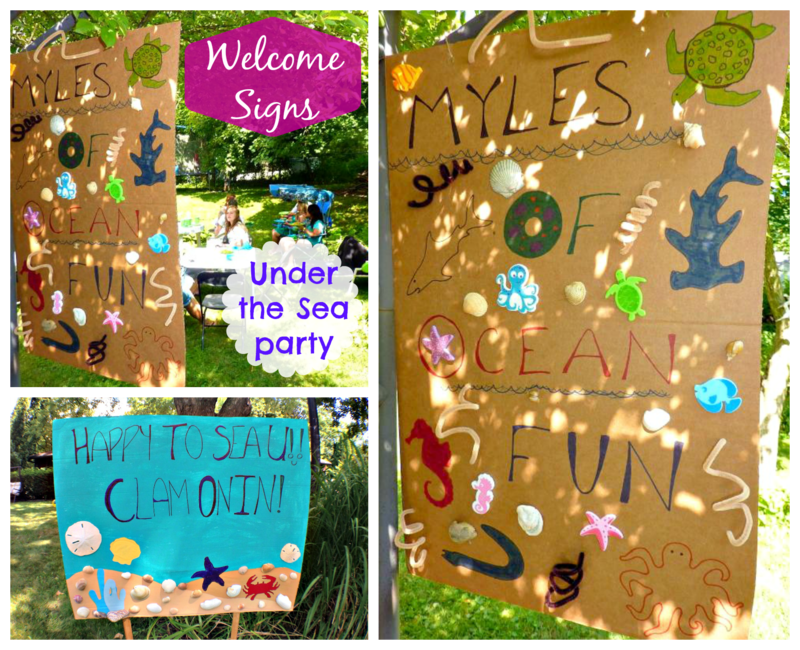 These are the welcome signs we made for the party. The 'Happy to Sea U. Clam On In" sign was in the front yard. My mom painted the sand and water on a piece of cardboard and then stenciled some sea creatures and shells. I hot glue gunned some real shells onto the board and my brother's friend wrote the saying. The other sign was hanging from a trellis arch at the backyard entrance. We made this one basically the same way as the other. I added some shells, foam stickers, and animal stencils. I also used pipe cleaners for a little more flare. Here is a bigger view of the sign and a couple other DIYs we did for decor. 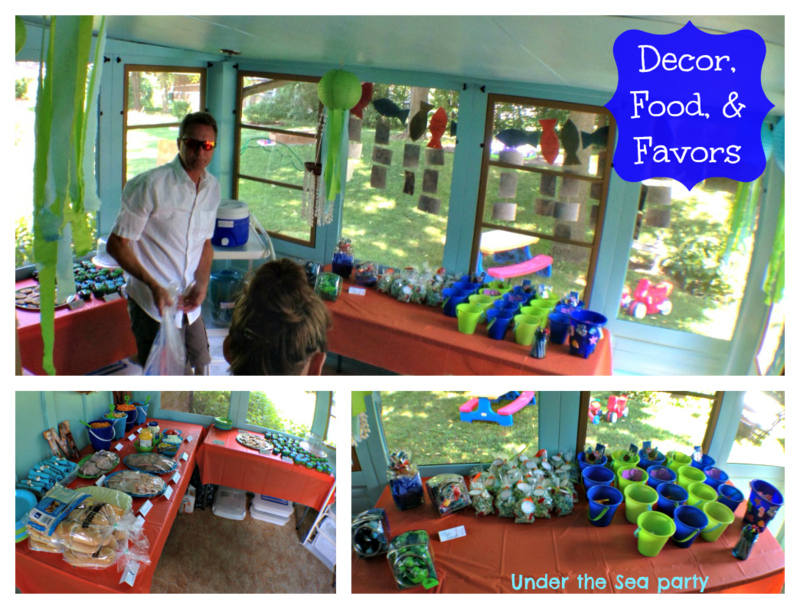 We used the screened-in porch to house all of the food, favors, etc., so we added some sea themed items back there too. I tried to make some jelly fish from paper lanterns, but they didn't turn out as I had wished. I just added some streamers to the inside of the bottom of the lanterns. I crinkled the streamers in hopes it would give them more 'movement', but they didn't stay that way. I still liked them, but I am not sure that they really looked like jellyfish. We also added a DIY anchor. My mom strung a fishing net onto the wall and then attached an anchor she made from cutting out cardboard and painting. On the outside of the porch, I hung the picture banner that I made. The hardest part of this DIY was deciding on just 3 pictures to use for each month. I had to go through and organize all the pictures I had taken for the past year! After I had all the pictures printed, I put the actual banner together. First, I cut out the fish shapes, four of each color (teal, green, and orange), from scrapbook paper. Then I laid out the fish in the arrangement I wanted them to hang. I wrote each month on the fish (newborn-11 months) and then hole punched each fish and picture. The top two pictures I hole punched both the top and bottom of the picture. 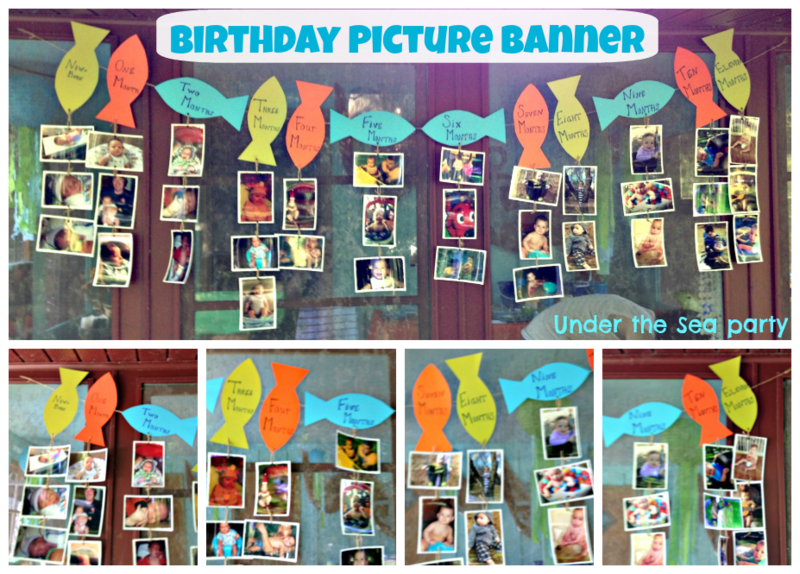 I tied the pictures together with twine and then to the fish that corresponded to the month of the pictures. Lastly, I taped the fish onto a long piece of the twine. My step-dad hung the banner with nails to the roof of the porch. This project took the most time, but it was my favorite part of the whole party. A peek into the porch: you can see all the details in the Food and Favors post. 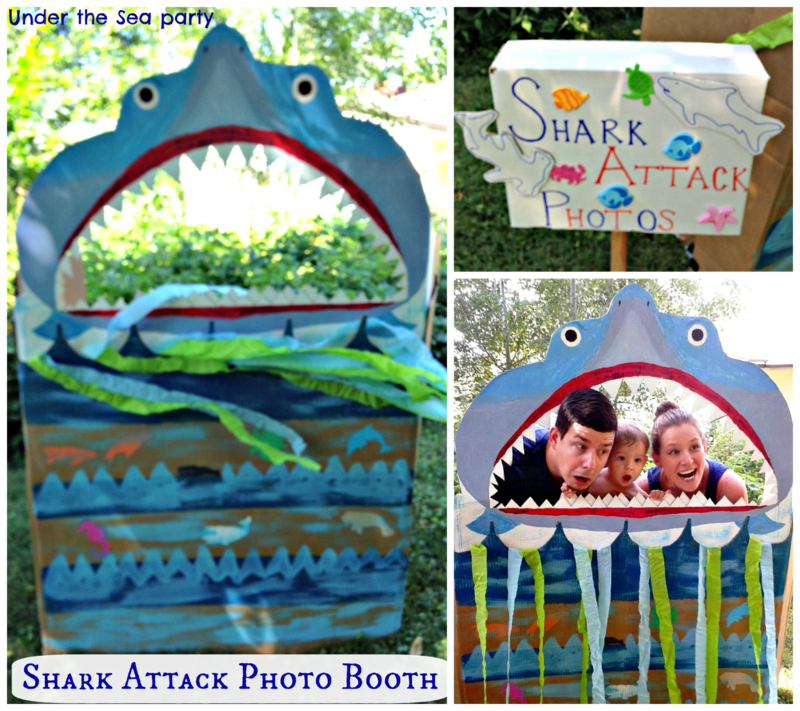 I already posted about our shark attack photo booth, but now I wanted to talk about how it was made. I got the inspiration from this picture I found on Pinterest and then I passed the dirty work off onto my family. They put their own spin on the idea and made it before we got into town. It was cut out of one huge piece of cardboard and then painted. They also added an extra set of teeth on the bottom. When I got there, I added the water/waves and streamers. I also made the sign for the photo booth. It is just a piece of cardboard that was folded and stuck in the ground with a stake. I wrote on it and then added some stickers and stencil cut-outs. This was my other favorite part of the party. I love the way it turned out. 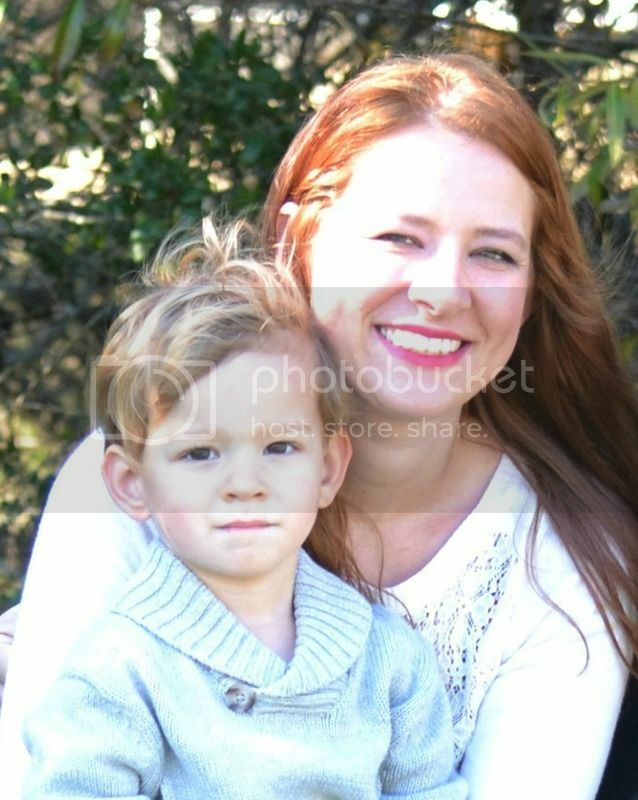 I don't know how I am going to top it for his second birthday. We had a lot of younger guests at the party, so I knew I wanted to have some games for them to play. 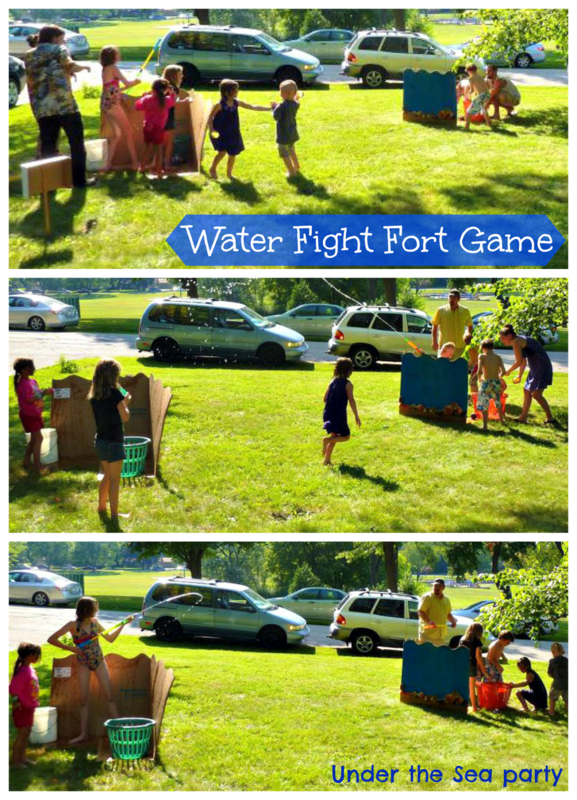 Since it was August and an Under the Sea theme, it was only right for the games to involve lots of water! I made all of the signs for the games the same way I did the one for the photo booth. This game we called "Deep Sea Fishing". 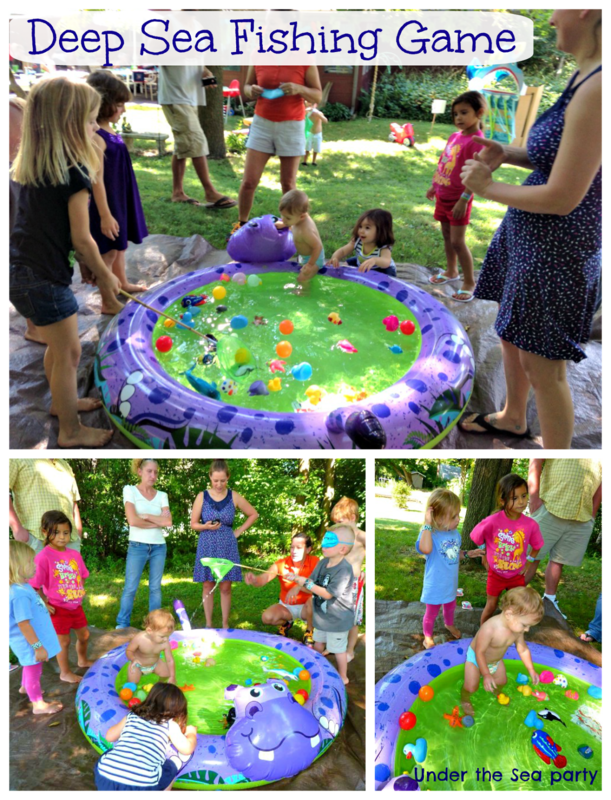 We filled up Myles' kiddie pool and added tons of floating toys (fish, ducks, balls, etc.). Then, we had each kid put on a blindfold and hold a butterfly net. I used the stopwatch on my phone to time them while they tried to pick up as many toys with the net in 60 seconds. My mom stood next to the kid playing and helped them empty the net when it was full. At the end of 60 seconds, my mom counted up all the toys they got and however many they got was the amount of pieces of candy they got to pick out to put in their sand bucket favor holders. Here are some shots of everyone playing. Myles just got into the pool and played with all the toys! The older kids did really well with this game though; a couple of them got almost all of the toys out in the 60 seconds! It worked way better than what I thought it was going to. There was just enough room for every kid to get a spot and they all shared very well. My uncle was trying to get Myles to join in, but he didn't really understand what was going on! All of the kids really loved this one too. The other game that was planned to be played (I made the sign and everything), was the "Crab Walk Relay". We ended up not getting around to playing it though. 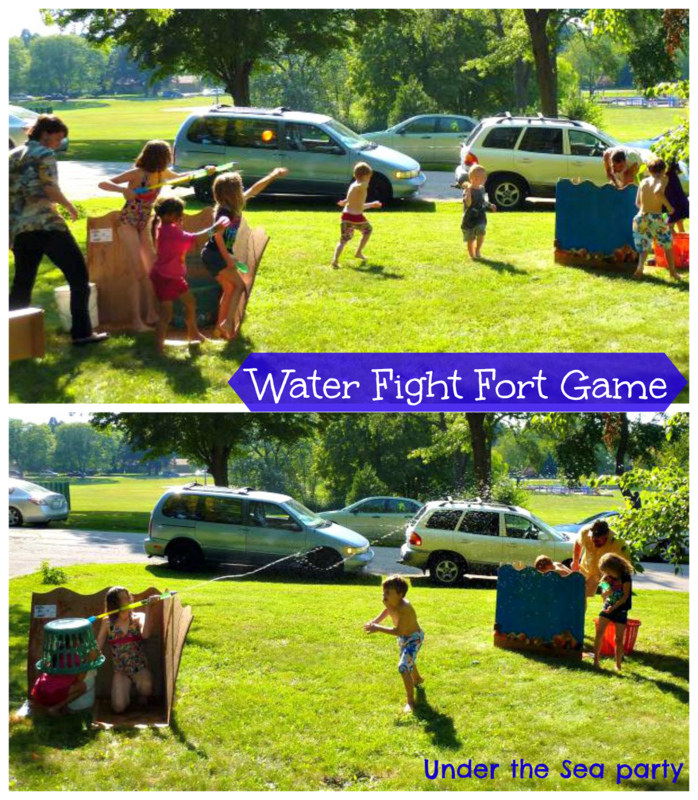 The kids were having so much fun playing with the water forts (see below), so we decided to just forgo that game and let them be. The plan was to have teams (kids and adults mixed) do the crab walk from one end of the yard to the other, relay style. We saved the messiest and most fun game for last! My mom and I had an idea to do a water fight, but we wanted to make it a little more exciting for the kids. So we came up with the idea to make these forts. 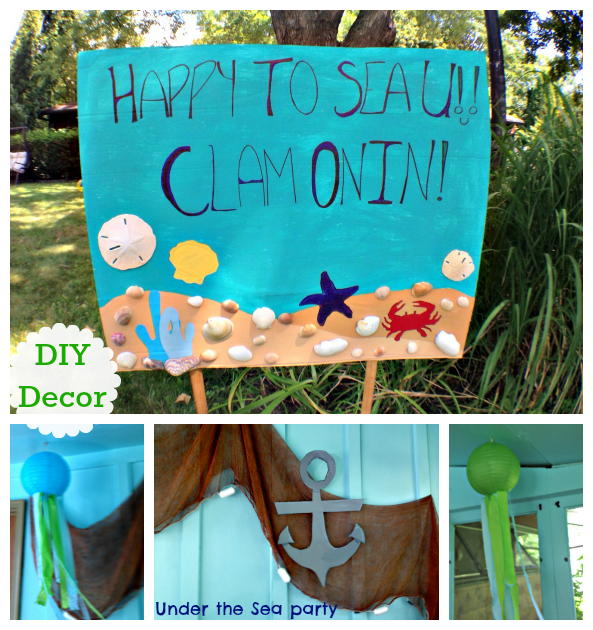 This was the last project we were trying to finish right before the party and we ran out of time to really finish them, but they turned out well enough for the kids to have fun! They are just folded cardboard that got painted, stenciled, and adorned with some 'coral'. My mom had the idea to use a couch cushion to make the coral at the bottom of the 'Great Barrier Reef'. My brother and his friend we in charge of this project. She tore up the cushion into small pieces, spray painted them, and then glued them to the cardboard. The only thing we didn't get to was painting the animal stencils. You can kind of see the black outlines of them in the pictures. Time just got away from us and really they were just going to get wet and mostly likely destroyed anyway. Once we got all the water toys, shooters, and balloons set up, they made teams.. and of course, it was boys against girls! We had two baskets full of balloons and a bucket of water for the squirters and shooters to get filled up. Surprisingly the balloons lasted a while, which led to the kids having tons of lasting fun! I mean what can top a water fight in the summer?!? As I finish this last 1st birthday post, I'm getting kind of emotional. The good thing is we will always have these pictures to look back on and we're less than two months away from his second birthday party! I'm hoping it's a good one too, but I'm okay with nothing ever being able to top this one! Although Myles won't remember it, he had the best time and we couldn't be more grateful to all our wonderful family and friends that made this the best first birthday any little boy could ever have! Thank so much for joining along in my obsessiveness and all your sweet and encouraging comments! Do you have any favorite party games? Ones that your kids love or you loved as a child? The games are such a fun touch!! 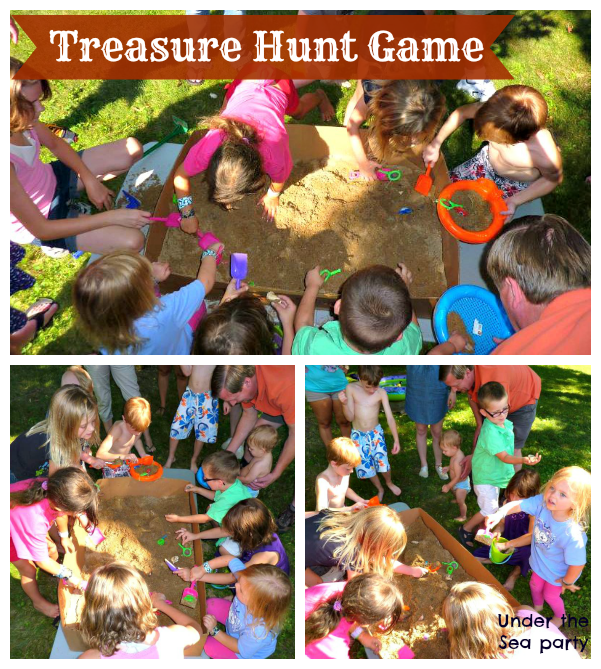 Love the treasure hunt and water balloon fights - what kid doesn't love to dig, and then toss balloons?! Awesome party! Your jellyfish turned out pretty cool, I think. Those games are so awesome! I bet the kids had a blast. My favorite piece is the banner. I'm totally going to use that cute idea for my girls' birthday! That's what I figured anything with water and throwing/ fighting is a total win in their book! Myles just kind of wandered around the whole time, but I know he loved it too.. even if he didn't totally know what was going on! How am I going to top this one!?! Wow! What a memorable party. It's amazing how creative we can be all in the name of love. It looks like a good time was had by all. Aww thanks so much! I'm sure she will love anything you guys do as long as she is with family and having fun! photos from this post hope it's find with you.! Hi! I hope you don't mind if we play the games you had in our baby's 1st birthday :) thanks! Your birthday games are really interesting. Wanted to know some games for my nephew’s birthday too. Will be booking one of event venues Chicago for the day. Have already looked for amazing ideas online and now just need to implement those. Very excited for the day.